The Department of the Interior has announced the first ever formal public comment period for members of the public to officially weigh in on monument designations under the Antiquities Act of 1906, and the Department released a list of monuments under review under the President’s Executive Order 13792, issued April 26, 2017. A public comment period is not required for monument designations under the Antiquities Act; however, Secretary of the Interior Ryan Zinke and President Trump both strongly believe that local input is a critical component of federal land management. Comments may be submitted online after May 12 at https://www.regulations.gov/document?D=DOI-2017-0002-0001 or at http://www.regulations.gov by entering “DOI-2017-0002” in the Search bar and clicking “Search,” or by mail to Monument Review, MS-1530, U.S. Department of the Interior, 1849 C Street NW, Washington, DC 20240. The Department published a notice in the Federal Register officially opening the public comment period on May 11, 2017. Written comments relating to the Bears Ears National Monument must be submitted within 15 days of publication of that notice. Written comments relating to all other designations subject to Executive Order 13792 must be submitted within 60 days of that date. For a complete list of National Monuments being reviewed and to read the Department of the Interior press release go here. To read the Federal Register Notice go here. SFWDA contributes $1,000 to the inaugural 2016 Share Trails Challenge. Each year we contribute a portion of our annual proceeds to other fellow nationwide stewardship organizations through. This we have a more direct mission to support our partners with the Blue Ribbon Coalition, now referred to as Share Trails. These folks work tirelessly to fight for our access across the entire nation and have been a great resource for us here locally in the South. We are currently working their representatives, lawyers, and consultants to ensure success on our Daniel Boone Backcountry Byway project. Sharetrails.org / BlueRibbon Coalition is nearly 30 years old and to celebrate we want to try something new, our first ever online Fundraiser Challenge. We really need your help to make it work! Our goal is to promote Sharetrails.org and the preservation of access through social media like we've never done before. We want this to go viral! Please accept our challenge to participate and by all means share, share and share! Show the preservationists and extreme environmentalists that you care just as much as they do about public land and support your rights to access by joining, donate and sharing. We've grown at a rate of about 15% over the past 7 quarters but we are still at a relative disadvantage in numbers because our starting point is far behind groups who oppose access. Preservationists groups succeed largely because of their numbers, not because of the merits of their arguments. As the only multi modal 50-state organization that fights for your rights to access we need to grow. More members increase our ability to stand up for access and makes us harder to ignore. Accept our challenge and join us - and bring along your friends who care about access. DONATE: We have received a generous match from Inland Empire Four Wheelers for the specific purpose of bringing onboard our first land use rep and ambassador for the Eastern United States, Randy Block. Please help us fund this position by donating to this fundraiser. CHALLENGE YOUR FRIENDS: Here's how it works. 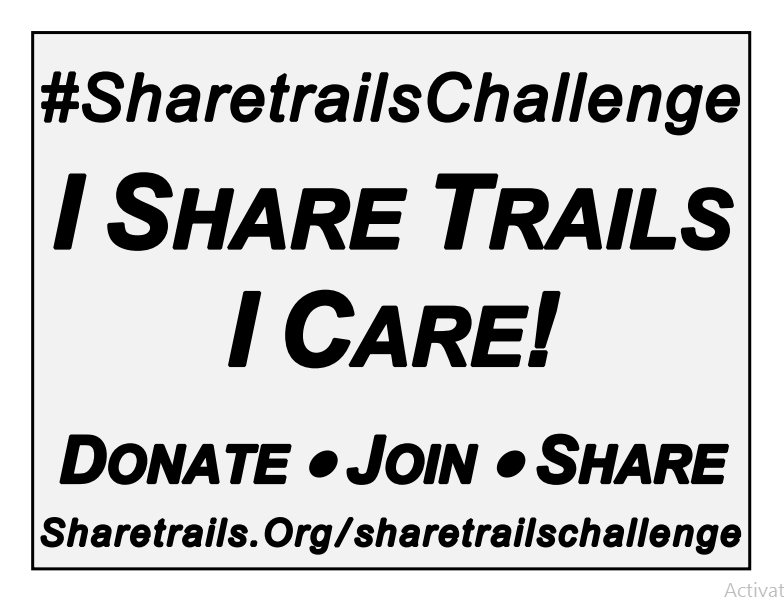 Go HERE to download and print a copy of our Sharetrails Challenge sign (or make your own). Then take a photograph or video holding the sign (interesting backgrounds are a bonus!) and share it on Facebook, Twitter and Instagram with the #sharetrailschallenge hashtag. Tell everyone how you are answering the challenge! Post your photo and comments to social media, send to your friends, tag them and challenge them to join and match your support for Sharetrails/BRC’s vision (to ensure that your posts show up in the feeds above, be sure to make your post public and also post it on the Sharetrails/BRC Facebook page). Sign up today for the Unlimited Off Road Expo Volunteer Land Use Awareness Booth Volunteer spots. Are you interested in the Unlimited Off Road Expo? Would you like to help be a part of our mission to fight for our trails? Can you help direct others how to become part of this team? We want you to become a part of our Conservation, and Education Mission! If you're available for as little as 4 hours; June 3-5 and can travel to Louisville, KY then join our SFWDA join Land Use Awareness Booth on the show floor and receive a free all access vendor pass to the event along a custom event polo shirt just for our volunteers. Sign up right now as a SFWDA booth Volunteer Representative at the UOR Expo (http://vols.pt/o89guy) on VolunteerSpot. This 4 hour block on a 4 person team will handle the operations of the Joint Land Use Awareness booth. . Responsibilities will include talking to and interacting with attendants to support Land Advocacy. Distribute literature to folks as they pass by. Engage them by inviting a moment to watch, and learn from our featured educational videos. We're using VolunteerSpot (the leading online Sign-up and reminder tool) to organize this event sign up. Join us December 5th in Oak Ridge, TN for our Annual Meeting where we wrap up the progress of 2015 and discuss the challenges, opportunities, and upcoming events of 2016. Whether your a life long member or just now heard of us, you are all welcome to join us at this important meeting. We'll meet at the DoubleTree Hotel conference room for our 9am meeting to cover all current events, budget & financials, web and social media growth, grant developments, current land use matters, plans for 2016, future events, and 2016-2017 elections. There are also several important BOD positions open. If you or anyone you know of might be interested please contact us. We're very excited and fortunate to announce several special guests this year. We've scheduled a special call in guest and a couple of attending guests from the Blue Ribbon Coalition and United Four Wheel Drive Association. This will be an interactive event. Everyone is welcome to attend. For those attending in person take this opportunity to meet and interact with fellow enthusiasts, industry leaders, land use representatives, OHV park owners and more. Webinar attendees can ask questions online using the Citrix chat box, vote online for upcoming BOD positions, and follow along on each discussion topic. All active eligible SFWDA member attendees can even vote during our BOD elections. If you can't attend this important meeting in person you can still participate. We want everyone who can't make it in person to join us online in our webinar. That's right, everyone can join us on your phone, tablet, laptop, smartphone, PC, or Mac. Register for the Webinar and attend the meeting from the comfort of your home. No other special equipment is necessary to listen and vote. Special room rates have been arranged at the host hotel, DoubleTree and are valid through Nov. 25th., so act now. The reserved block of rooms at the discounted rate are available for all attendees if you follow this link below. Attached is a copy of the Access Army Times newsletter that is generated every couple of months from BRC. The Bureau of Land Management (BLM), Southeastern States Field Office (SSFO) has released their Draft Resource Management Plan (DRMP) and Draft Environmental Impact Statement (DEIS) for your review and comment. Yesterday, The BlueRibbon Coalition (BRC) filed a complaint against the Federal government to challenge the arbitrary closure of, "Trail 38," a high value single-track motorcycle trail in Wyoming. The BRC Legal Program is representing a local AMA District club and local users in the case.